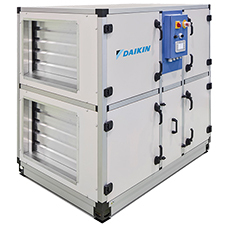 Daikin Applied have announced the launch of the new Multifunctional chiller series the “4Z”. The capacity of the new series ranges from 400kW up to 1415kW, equipped with Daikin single screw compressor, inverter driven and variable volume ratio technology. The launch comes after market demand for a system that allows heating and cooling in different areas of the building. 5. Heating demand higher than cooling. Multifunctional units can be considered as an efficient alternative to traditional solutions where, for example, chillers are used to satisfy the cooling load and boilers are covering the heating load. Multifunctional units are also capable of satisfying contemporary cooling and heating demand without any restriction. Not only do Multifunctional units allow significant cost savings on installations, but they are also a very efficient solution thanks to their capability of energy recovery. In buildings where a contemporary cooling and heating solution is required, the Daikin Applied 4Z system works in heat recovery mode, avoiding the typical energy waste of traditional equipment. When working in total heat recovery mode the unit simply “transfers” the heat from the cooling loop to the heating loop. That specific operating mode allows new Daikin Applied “4Z” series to achieve efficiency in total heat recovery mode that reaches 8.7. 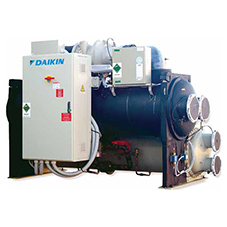 The new Multifunctional series is also equipped with latest Daikin design of the single screw compressor. 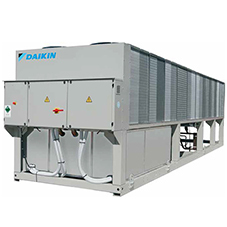 That compressor is fitted with Daikin’s design inverter that is cooled by liquid refrigerant. The inverter drive is integrated within the compressor casing allowing simplified unit design and reduced unit footprint. The refrigerant cooled inverter allows the installation of the unit in even the most extreme environments. The inverter drive is modulating compressor capacity at part load in the most efficient way. In this way, the energy consumption at part loads is drastically reduced compared to fixed speed compressors. 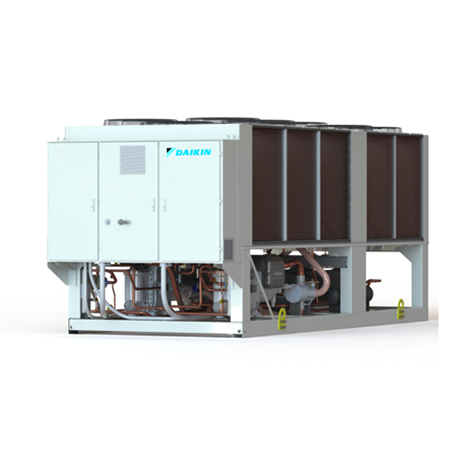 More than this, the Daikin compressor is enjoying Variable Volume Ratio technology (VVR). A specifically designed slide vale adjusts the geometry of the discharge port so that the refrigerant discharge pressure can match with the condensing pressure. VVR technology is the best possible solution for Multifunctional units that are required to operate during the year at various conditions of temperature, cooling and heating load demand. The Daikin Applied “4Z” is available in three different sound configurations that can satisfy various installation requirements; the super quiet version can go down to 66 dB(A) sound pressure level at one meter distance. Thanks to the capacity modulation with inverter, depending on unit model and rating conditions, sound levels reduce by an additional up to 10 dB(A) at partial loads. Also the operating envelope is vast: hot water production goes up to 61°C and chilled water can go down to -10°C in case of process cooling applications. The new “4Z” series is compatible with the latest Daikin Applied control and monitoring platforms. The Daikin on Site cloud based platform allows a number of advanced functionalities including remote monitoring, system optimisation and preventive maintenance.